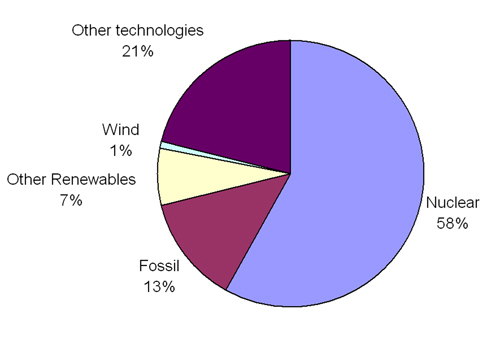 Historically, research and development funding to wind energy and other renewable energy technologies has been a fraction of the funding to conventional energies. 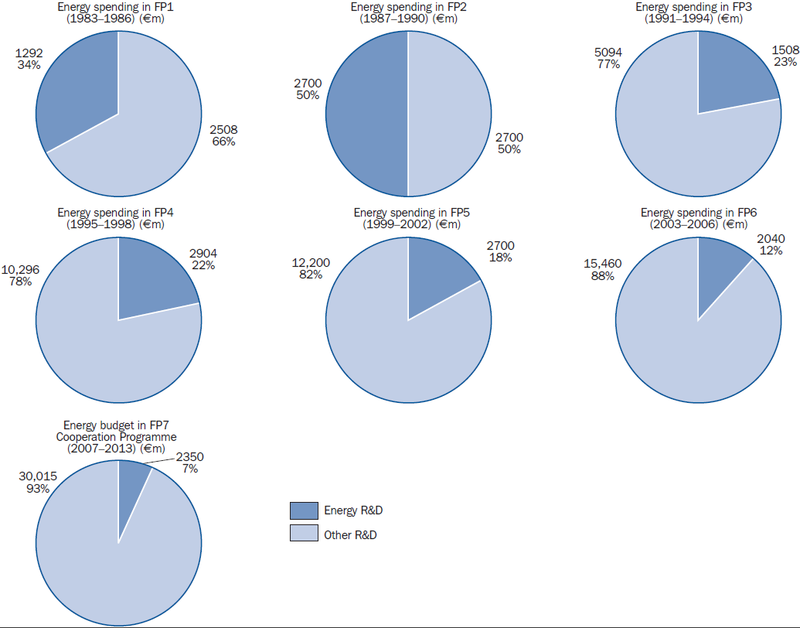 According to the IEA, over the period from 1974–2002, nuclear energy research financing was approximately three and a half times greater than that dedicated to renewable energy. The technology achievements in wind energy are even more impressive given that the sector has received a mere 1 per cent of energy research funding in the IEA countries in 1974-2002. In the same period, nuclear energy received 58 per cent, or $175 billion, and fossil fuels 13 per cent (see Figure 7.1). 'The current Framework Programme allocates €1.95 billion, or almost 40 of the energy funding, to nuclear fusion, a technology that is only expected to contribute past 2050. It will be important for the achievement of the EU climate change targets that this funding allocation is revised at the earliest possible opportunity, and that funding for non-nuclear energy research and development is increased significantly' (IEA in September 2008). The EU FP7 Euratom programme allocates €1,947 million to nuclear fusion, €287 million to nuclear fission and €517 million to nuclear research activities of the Joint Research Centre (JRC). In total, EU nuclear energy research funding totals €2.75 billion over the five-year period 2007-2011 or €550 million per year. Non-nuclear energy research under the EUs FP7 receives €2,300 million, over the seven-year period 2007-2013, or €460 million per year. How much of the EU non-nuclear energy research budget will go to wind energy is not earmarked, but as shown in Figure 7.3, wind energy received €25 million under FP5 and €32 million under FP6, or approximately 3 per cent of the total FP7 energy research budget. In 2005, the European Commission’s Advisory Group on Energy released a report that demonstrated the full extent of the reduction in European Union funding for energy R&D through its Framework Programmes. This state of facts is illustrated by Figure 7.2, showing that energy research funding as a percentage of all EU R&D funding has reduced from 66 per cent in FP1 to around 12 per cent in FP6, and 7 per cent in FP7. Under FP6, EUR810 million was dedicated to R&D under the “Sustainable Energy Systems” chapter (EUR405 million to long-term R&D, administered by DG Research, and EUR405 million to short- to medium-term research, administered by DG TREN).This represented a reduction of some 20 per cent from FP5. The name of the chapter or budget-line, 'Sustainable Energy Systems', engendered a lack of transparency in the funding process. The chapter included, for example, 'clean coal' technologies, focusing mainly on the sequestration of CO2. It also included hydrogen and fuel cells, which are not energy sources. Knowledge for energy policy making. In 2007 the budget committed to projects was approximately EUR 0.32 billion. Wind farm development and management. Due to two integrated projects (DOWNWIND and UpWind), the average project size increased significantly between FP5 and FP6. The EC contribution also increased by 27, per cent and reached EUR 31.59 million, an average of EUR7 million/year – one tenth of TPWind requirements.